show an assured choice and flexible use of standard English vocabulary and grammar in appropriate situations. s. They are also able to make sophisticated analysis of aspects of language and structure within a text. When pupils write, sophistication and subtlety prevail and there are distinct reasons for readers wanting to read their work as it is delightful, has flair and originality. The work of pupils has high levels of whole text coherence as paragraphs and other structural and organisational devices complement and fully support the purpose and thrust of the piece. Pupils can use varied and sophisticated sentence structures and a range of punctuation highly purposefully and effectively; punctuation is used as another means to heighten impact of writing. Pupils’ spelling is almost always accurate when using specialist or less commonplace vocabulary; they also have impressive control over even highly irregular spellings. Different exam boards and specifications can often have very different requirements so make sure you cover the requirements of your school, subject and specification. Your Key Stage 4 topics will become a skeleton for Key Stage 3. This does not mean you begin to teach the Key Stage 4 course three years early; that would be of no benefit and would bore your poor pupils senseless. You are going to build their confidence and independence in each of the topic areas by building a clear progression path towards GCSE success. Make sophisticated analysis of aspects of language and structure within a text. Once you have covered all necessary topics, you now need to arrange them to fit your Key Stage 3 plan. In order to create a progressive curriculum, you should plan to teach all topics and vocabulary in Year 7, allow pupils to experiment with the topics further in Year 8 and allow space for individual growth in Year 9. If you keep your topics the same, opting to change the medium through which they are taught planning this kind of progression will be far easier for you. 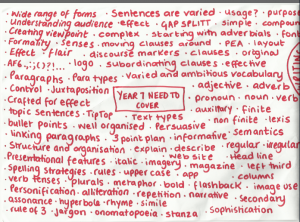 Below is an example of the above topics for English separated out into half terms for Year 7, 8 and 9. In later plans the above will be developed with the following in mind: pupils have just arrived from primary school and they are likely to be enthusiastic. You must ensure that this year remains enjoyable for them and that topics match their level of maturity. They should be taught the vocabulary necessary to access all topics while having lots of fun. In later plans the above will be developed with the following in mind: Pupils are beginning to mature. Choose your subject matter carefully to suit their changing needs. Avoid contexts that are too young for them as this may be seen as patronising and turn them off learning. This year should be an exploration of the skills and vocabulary taught to them in Year 7. They should be given the opportunity to apply it in different situations and be given opportunities to create their own conclusions. In later plans the above will be developed with the following in mind: This is pupils’ final year in Key Stage 3 and should be seen as an opportunity to hone their skills ready for Key Stage 4. Pupils should be given lots of opportunities to practice in the way that they will be expected to perform in their up coming years but remember to avoid repetition. Do not make them sit controlled assessment after controlled assessment as this will only serve to turn them off your subject. Keep your teaching materials relevant and interesting but have their forthcoming years in mind. If you want your pupils to be ready to achieve A*s from the moment that they walk into your Key Stage 4 classroom, you need to ensure that there are no loose ends left to tie up at the end of their Key Stage 3 experience. Our skeleton plans are an important starting point for our next step; we now need to make our shopping lists. This next stage takes some time and the more people from your department that join in the better. It was during this next stage that inconsistencies in our department began to surface. People had very individual ways of teaching pupils how to create essays or respond to reading questions; all manner of acronyms were being used and all for the same end purposes. Pupils were understandably confused and it was our fault! Consistency is vital. There is absolutely nothing wrong with being individual in your way of teaching but if you are passing a class on to another teacher the following year (as often happens in secondary schools) you need to be consistent in your approaches for the sake of the pupil. This next step allowed us to discuss our approaches and decide on how we taught specific skills collectively so as to help pupils make the transition between teachers and not have to be taught a new way of doing the same thing again. To get started on your shopping list, take every topic area and write it as a title on an A1 sheet of paper; the paper size is not an absolute rule but the benefit of using A1 paper is that you can fit lots of information on there and your whole department can join in with the contributions. Use all of your Key Stage 3 and 4 documents to find out exactly what pupils need to know. Write out everything as one long shopping list of expectations. Above is my shopping list from an English writing scheme. Personally, I like to create my shopping lists as an explosion of words much like a mind sneeze that I can return to later and cross off as I insert them into my scheme. However, for the more linear minded teacher, you may wish to begin by working in sections (see below). It takes time to work out exactly what each half term of your subject entails but this process is both necessary and rewarding. Notice that there is no particular order to what is being written down. Order is not as important as coverage at this point as we will be making sense of what goes where in stage three. You may find it easier to section off what you are writing down to make sure you cover every aspect of your curriculum. I usually write about one topic area at a time; for example the above topic area is writing. I also write about one assessment focus at a time for example paragraphs then punctuation followed by spelling, so that I ensure all areas have been thoroughly covered. We are ready to add the muscles to our bones now. Once you have your shopping lists complete, you can begin to match up the skills and vocabulary to the right topic area. There will be overlaps and you want to avoid repeating yourself unnecessarily as well as plan in opportunities to consolidate understanding. 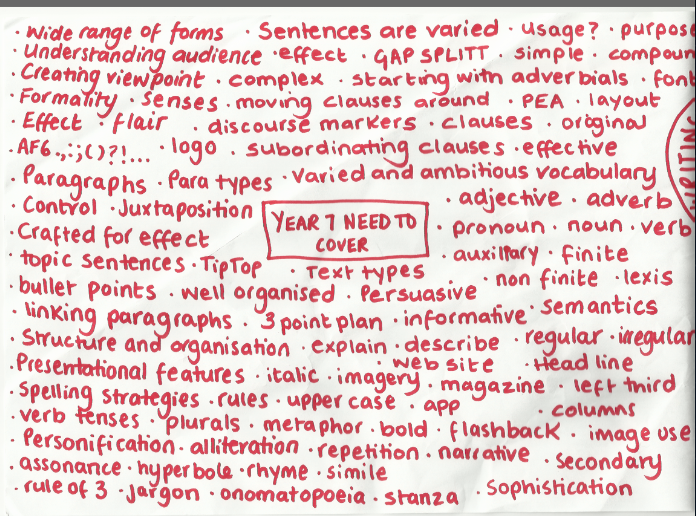 You should plan to introduce all of the vocabulary that your pupils will need to access your subject in Year 7. Pupils should then be given the opportunity to explore using the vocabulary in context in Year 8 and be coached towards independence upon reaching Year 9. At this point we are not making any decisions about the content or focus of individual lessons, we are thinking in terms of covering all of your subject’s essentials. Keep progression at the heart of your plan. Think about what needs to be covered first and how you can build upon that over the year. Look to see where there are crossovers between content and help pupils to make connections between these ideas. If pupils can make links between a topic that they have already mastered and a new topic, they are likely to feel more confident about the new topic. Research into how experts think (Bransford et al. 2000) showed that topic experts think in patters by making relationships between concepts. we are encouraging a more expert approach to their studies. If you have followed all of the steps thus far, you should now have a pretty solid, consistent and progressive plan of action… but it is very boring! What pupil wants to sit and listen to what a metaphor is followed by what a discourse marker does? It is time to get creative with your content. You now need to think of ways to deliver your subject to build the skills needed for GCSE across three years without being boring, repetitive or out of touch. Think from a pupils’ point of view; what would they want to learn about? What interests them? What is going to be interesting enough to hook them in and convince them that yours is the most exciting subject in the school? While developing our school’s Key Stage 3 curriculum, I was lucky enough to be involved in the plans of many of our departments. One department has a very bad reputation for being a dull subject, not just in our school but across the whole of England and out into the wider world. Yes, that subject is Mathematics. I am ashamed to say that I often think of Maths as a boring subject too. I remember at school the words from my teacher: “Why don’t you just get it?” I did not “get it” because it seemed boring and pointless. I was that annoying kid who had to ask: “When am I ever going to use this anyway sir?” Surly enough, I rarely have to as I opt out of Mathematical situations even now as a result of the boring rote teaching I was subjected to; it meant nothing to me. In my adolescent mind, there were no connections between what I did in that classroom and the life that actually mattered to me. The only person that knew what was going on was the teacher and he did not think it was necessary to let me in on it. He put me off for life. Our Maths department could have saved me from a life of number fear. They have approached teaching Maths with fresh eyes and have avoided the traditional rote lessons that I was subjected to. Every lesson begins with a question; a real life applicable question that you would actually want to know the answer to. For example: “What Maths do I need to organise my 21st birthday party?” Pupils then investigate the answer and actually ask to be taught the skills needed to complete their investigations. It is this kind of and creative thinking that needs to be adopted at this stage of your planning. Avoid going for the tried and tested methods if they are old and dusty. If you have copies of it on acetate then chances are it is way too old fashioned for the kids of today. Think about what your pupils enjoy doing; you could even ask them and avoid getting it wrong. Survey Monkey is an excellent tool for hearing your pupils’ voice and if you act upon their advice, you are much more likely to engage them. For our English scheme, we too adopted the enquiry question approach. Knowing that Year 7 are still quite young and enthusiastic in their first half term with us, we went for a very fun pirate themed content. Films such as Pirates of the Caribbean and Lord of the Rings could be teamed with more traditional pirate adventures like Robinson Crusoe to create a really rich base to work from. We wanted pupils to take pride in their work throughout their time at JSA and so “What Do I Treasure?” was our question for the term. Pupils cover all of the necessary vocabulary for writing descriptions while having fun in treasure themed lessons. YEAR 7 ENQUIRY QUESTION: What do I Treasure? How what we have worshipped has changed over time? Each year group must be a very different experience to the last, always taking into account what pupils now know and attempting to get them closer to independence each year while still maintaining their enjoyment of your subject. Year 8 would follow the same Key Stage 3 and 4 assessment foci but their first half term topic changes to what am I passionate about? This is an exploration of their loves and hates to create a descriptive rant using sarcasm, subtly and irony. They will build on everything that they learned in the previous year but now explore the possibilities of their creations by experimenting with their language choices. Thanks to a clear plan for progression, pupils now have all of the vocabulary they need to succeed and they are building upon their existing skill. This skill is essential to their achievement in Year 11. They are provided with frames and support in Year 7 and this support is gradually taken from them allowing them to practice unsupported in controlled assessment conditions in Year 9, meaning come controlled assessment time in Year 10, they are ready! You now have a well-structured plan that could be adapted to suit most classes at this point but we are not finished yet; if you are a Head of Department, you may wish to ensure that weekly progression is assured as part of your departmental policy or if you are a classroom teacher you will need to plan for pupil progression. If you teach topics in isolation you are not encouraging pupils to build upon their pervious knowledge. Thinking about the correct order of delivery and how individual lessons are building towards a greater understanding of the intricacies of the overall topic will encourage your pupils to make sense of the overall topic. For example, if the overall topic is writing to describe as seen in the previous example for a descriptive piece, you should begin at a word level and teach the skill of text analysis before progressing to a more individual analysis of literary devices. You must teach the elements of a good quality description, provide opportunities to explore examples, experiment and offer feedback before the creation of a final piece which demonstrates all of the above has been understood. After the time you have now spent organising your subject’s needs in stages one to four you will have a breakdown of the intricate details of your own subject area; with a little imagination your weekly overview should now be easy to create. Who Gives a Crap Anyway? What are you marking that for?